Your friendly, English speaking driver will greet you at your point of arrival, accompany you straight to Pompeii in your air-conditioned chauffeur driven vehicle where will stop for 2 hours, to let you visit Pompeii ruins with an official multilingual guide, and then drive to your accommodation in comfort and true Italian style. Our driver will wait for you at exit gates of Naples airport or at the end of the tracks into Naples Train Station or at the dock of your ship at Naples port, will have a tag with your surname on it and will help you to carry the luggage. 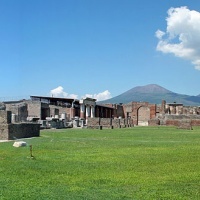 We will stop in Pompeii for 2 hours to let you visit the memories of the catastrophic destruction of the ancient citiy. 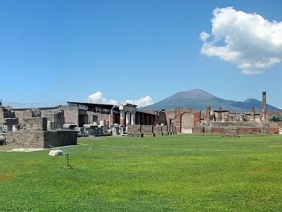 Pompeii is a vast archaeological site in southern Italy’s Campania region. Once a thriving and sophisticated Roman city, Pompeii was buried in meters of ash and pumice after the catastrophic eruption of Mt. Vesuvius in 79 C.E. Near the coast of the Bay of Naples, the site features excavated ruins that visitors can freely explore. Check more on Wikipedia. Transfer with the stop in Pompeii duration is about 3 hours and 30 minutes it may vary depending of traffic conditions., the distance between Naples and Positano is about 70 km (45 miles). The transfer will be provided by a Mercedes Benz car (till 3 people) or Mercedes Benz Minivan (from 4 to 8 people), both vehicle with air conditioner. Price valid for pick-up at Naples train station, Naples port or Naples city centre too. Please provide the details of your flight or ship or train or address of your hotel in the booking form to arrange the pick-up at the best. We suggest a typical mediterranean lunch in Pompeii, to let you taste the natural and genuine food of the area. Message us to know the additional price for your meal. If you wish to book a licensed guide for a tour of Pompeii, message us clicking on make an offer, we will adjust the price including this option too.